These lemon print culottes are on trend this season! This tie front floral blouse is only $13. This wardrobe basic swing top is only $11. This pretty ruffle blouse is only $13. This vintage classic tee is on sale for $15. This tee with the split sleeve comes in one of my favorite colors. These popular aviator sunglasses are 25% off. These fun floral shorts are only $15. This is a cute bold striped dress. This shopper tote is 40% off - and comes in a fun gold metallic. This striped boyfriend sweater is 40% off - and also comes in solid colors. These cute scalloped block heel sandals are 40% off. I love these floral jogger pants! These sling back scalloped ballet flats are only $18 - and come in 3 colors. This floral wrapped camisole top is only $10! These popular ankle strap sandals in leopard print are price matched! I like this chunky necklace that is on sale for under $20. This classic blazer is on sale for $45 - can comes in three colors - white, red, and blush. Just in case you missed it - I shared more picks HERE. I have been obsessed with jumpsuits lately and though it's been hard to pick one, I do enjoy looking at them. Weird, huh? 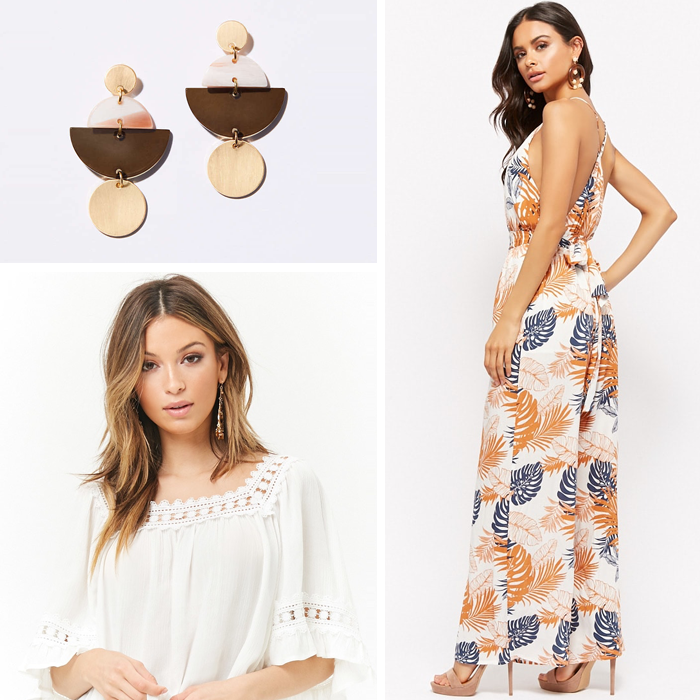 This jumpsuit you featured is just so beautiful and the palm print is fantastic. It's giving me all the summer feels!